I’m back to knitting Monkey. And Monkey now has a back. I’m completely enamored with this knit and am starting to envision an entire zoo, full of knitted animals. Fortunately, I’m not the only one. 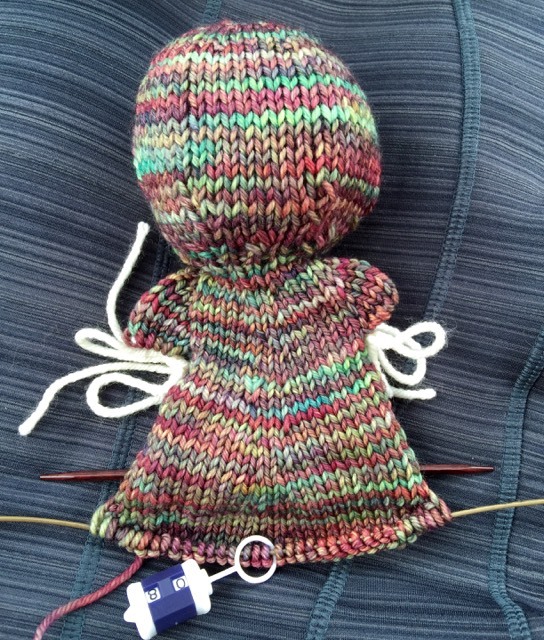 We’ve decided to include a group for knit stuffed animals and monsters as part of the Adventurous April KAL. I’m planning a cat or bunny to follow Monkey. There are an amazing variety of fabulous knit stuffed animal patterns on Ravelry, many of them free. If you’ve never knit a stuffed toy, you should come join us in the KAL. And if you have made one or more in the past, you should come knit with us and share your ideas and expertise. Toys are not something I ever saw myself knitting, but my best friend and I have a 30-year tradition of exchanging gifts, so when I saw the original Monkey Jacobus pattern, I couldn’t resist. And now, I’m hooked! I’m going to have a grandchild in midOctober and may start looking at knit animal patterns (going beyond knitting just scarves and socks?). I look forward to seeing your completed monkey. Congratulations! That is such wonderful news! Have you seen all of the patterns linked to on the Ravelry thread? There are a lot of cute ones, and someone linked to a tiny bunny this week that would be awfully cute for a baby, especially in angora (at least until the baby threw up on it).